"Which do you like better, bacon or sushi? From now on you no longer have to choose! 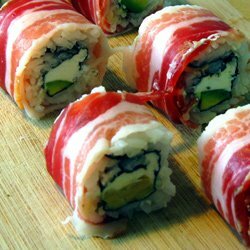 Introducing the Epic Sushi roll: Deliciously filled with cream cheese and avocado and wrapped with smoked bacon on the outside. Simply awesome." 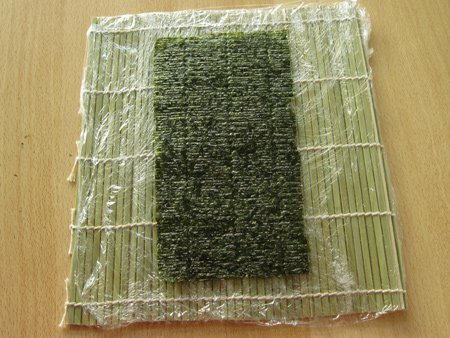 Take one ‘Nori’ sheet, and split it in half along the longer side, and place it on a plastic wrapped bamboo mat with it’s rough side facing up. Wet both your hands and take a handful of rice. How much rice you want to use is really up to you, here’s about how much I used in the picture below. 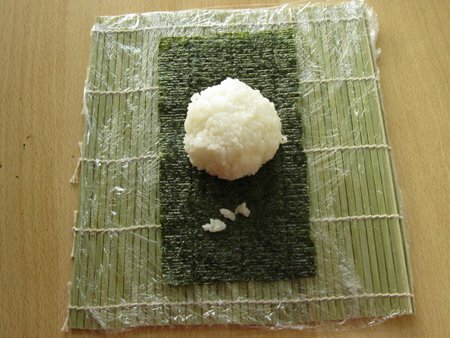 Make the rice into a nice ball – don’t squeeze it though, and place it on the nori. 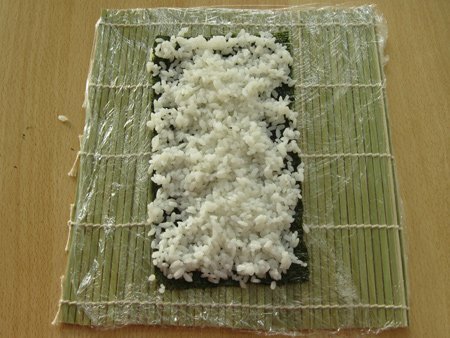 Gently spread the rice around to cover the entire nori equally. Don’t press the rice down, it’s supposed to be fluffy and about half an inch high. 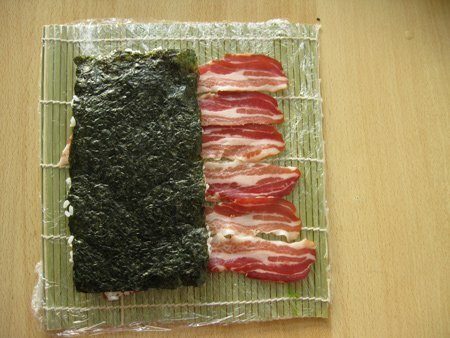 Put the nori and rice aside on a plate, and align the bacon strips on the bamboo mat. 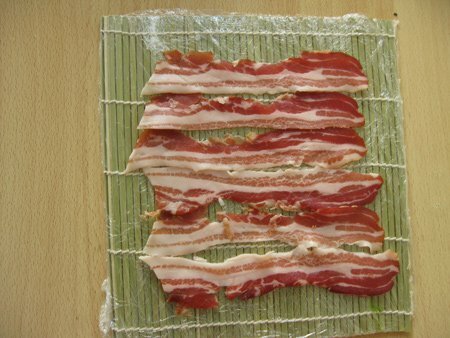 Make sure you use as much bacon to cover the full width of the nori (you can use the other nori half to measure). 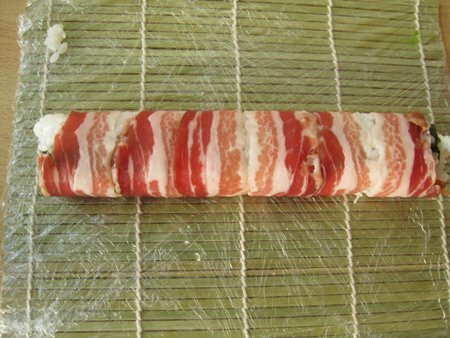 Make sure the bacon strips do not overlap. That way it’s easier to cut the sushi roll when you are done. 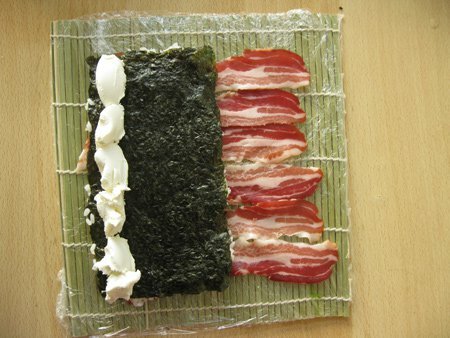 Now bring back the nori with the rice, and place it over the bacon strips, rice down. Oh yea, cream cheese is on. Not in the picture is the slices of avocado to be placed alongside the cheese line. Use as much of it as you like. Roll this thing like you would roll any other inside out sushi roll. Give it an extra press, lift up the mat and behold! Cut the roll into 6 to 8 pieces. 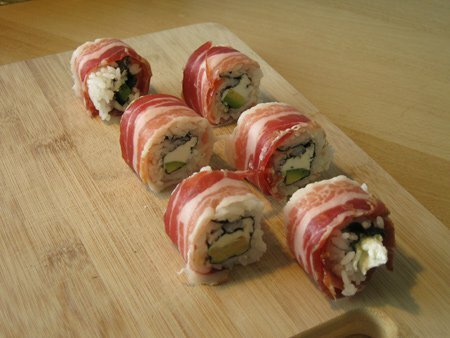 It’s best to cut in between the bacon strips, so you end up having as many pieces of sushi as bacon strips used. In this case I used 6. This looks interesting but I dont know anyone who would look at this and think its raw as most bacon here gets cooked. Yes IF the package says fully cooked you can eat it but maybe using Proscuitto might be more appetizing and less questionable. That’s cured and smoked bacon – safe to consume. Check your packaging label to confirm before consuming. Thank you for the recipe. I followed all your steps and me and my boyfriend love it! Just delicious! Did you use raw bacon? Actually this looks great and I would try it. It is simple to make without having to have to many steps and filling to add. Thanks for this recipe. Great read. I have a friend that does this and was actually indicating interest. I’ll start with this and have her guide me further. Nice one. Really good instruction, So this is reason why the half cut Nori is needed. Hey… Nice to come cross this here. I’ll sure try it out, I’ve always loved to make this myself but had no idea on how to start. This is just a great guide. I really needed this. Many thanks to the author. Will definitely come back with questions in case I’m stuck. This is really interesting. I will certainly share this with my girlfriend. I’m sure she will love to give it a try. Great work!